Watch live video on NASA TV! Shuttle Endeavour completes mission STS-108 to Space Station Alpha! 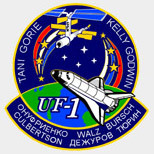 The mission patch features the names of the "core crew" around the top, with a tab underneath showing the names of ISS crews. Today's landing brings to an end a voyage of more than 4.8 million miles for Endeavour and marks the 57th shuttle landing at the Kennedy Space Center. Landing videos here and here. That wraps up the last spaceflight of the year - HAPPY HOLIDAYS!! Space Shuttle Endeavour landed at the Kennedy Space Center today ending STS-108, the 12th mission to the International Space Station. Aboard were Frank Culbertson, Vladimir Dezhurov and Mikhail Turin--the Expedition Three Crew--coming home from the Station after a four-month stay. The STS-108 crew, Commander Dom Gorie, Pilot Mark E. Kelly, and Mission Specialists Linda Godwin and Daniel Tani delivered cargo and the Expedition Four Crew to the Station, and installed thermal blankets on devices that control the Station's solar panels. They also deployed the Starshine 2 satellite yesterday. More than 30,000 students from 660 schools in 26 countries will track Starshine 2 as it orbits the Earth for eight months. The students, who helped polish the spacecraft's 845 mirrors, will use the information they collect to calculate the density of the Earth's upper atmosphere. Flight Day 12 videos are now available in the NASA Gallery. Space Shuttle Endeavour began its descent to Florida when STS-108 Commander Dom Gorie performed the deorbit burn at 10:48 a.m. CST [11:48AM EST/1648 GMT] today. Endeavour is on course for a landing at Kennedy Space Center, Fla., at 11:55 a.m. CST [12:55PM EST/1755 GMT]. STS-108 is returning home after a successful mission to the International Space Station. The STS-108 mission delivered the Expedition Four crew and the Raffaello Multi-Purpose Logistics Module. 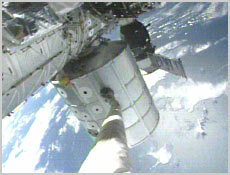 They conducted one space walk to install thermal blankets on the Beta Gimbal Assemblies on the station's P6 Truss. Also returning on Endeavour is the Expedition Three crew. The crew of the Space Shuttle Endeavour began what should be their last full day in space today with the wake-up song, �Please Come Home For Christmas� sung by Jon Bon Jovi. The seven crewmembers were awakened at 3:19 a.m. CST [4:19AM EST/0919 GMT]. Space Shuttle Endeavour and the STS-108 and Expedition Three crews are scheduled to return home today. The first of two landing opportunities available to Endeavour is at 11:55 a.m. CST [12:55PM EST/1755 GMT] at Kennedy Space Center, Fla. Weather forecasts indicate generally favorable weather conditions in Florida for landing. However, there is a chance of rain in the vicinity. If flight controllers elect to take the first opportunity, the deorbit burn would occur at 10:50 a.m. CST [11:50AM EST/1650 GMT]. The second opportunity is at 1:32 p.m. CST [2:32PM EST/1932 GMT]. at Kennedy, with a deorbit burn at 12:28 p.m. CST [1:28PM EST/1828 GMT]. A landing today will conclude a voyage of more than 4.8 million miles for Endeavour, and 129 days in space for Culbertson, Dezhurov and Tyurin. STS-108 is returning home after a successful visit to the International Space Station. It was the 12th shuttle mission to the station and the 6th in 2001. Flight Day 11 images are now available in the NASA gallery. Check the play-by-play links at upper right for up-to-the-second commentary. Live coverage continues on NASA TV. Endeavour's crew has checked out landing systems and all is ready for a trip home Monday, aimed at a touchdown at 11:55 a.m. CST [12:55PM EST/1755 GMT] at the Kennedy Space Center in Florida. Weather forecasts are generally favorable, but there is a chance that showers could form offshore. If the first landing opportunity is taken, the deorbit burn is at 10:50 a.m. [11:50AM EST/1650 GMT]. Monday�s other opportunity would have the deorbit burn occurring at 12:28 p.m. CST [1:28PM EST/1828 GMT] and landing at 1:25 p.m. CST [2:25PM EST/1925 GMT]. On Tuesday, STS-108 will have two landing opportunities at Kennedy and two at Edwards Air Force Base, Calif. In other activities, the crew deployed the STARSHINE 2 satellite at about 9 a.m. CST [10:02AM EST/1502 GMT] Sunday. As the small satellite orbits the Earth, more than 30,000 students from 26 countries will track it during the next eight months to collect information in order to calculate the density of the upper atmosphere. Flight controllers do not plan to consider landing opportunites other than Florida on Monday. Endeavour's crew begins a sleep period at 7:19 p.m. CST [8:19PM EST/1319 GMT] today. Wake-up is at 3:19 a.m. CST [4:19AM EST/0919 GMT] Monday. Re-entry timeline here. Flight Day 11 videos are now available in the NASA Gallery. Following a successful check of Endeavour's flight control systems and surfaces, as well as a good test of the small jets that will be used to steer Endeavour during reentry, the crew will continue to ready themselves and their vehicle for a landing tomorrow. On board, the crew is beginning to put away the equipment, cameras and hardware they've used over the past 10 days on orbit, and to install the recumbent (reclining) seats in which the Expedition Three crew will return to Earth. With a landing tomorrow, the Expedition Three crew, Frank Culbertson, Vladimir Dezhurov and Mikhail Tyurin, will have spent 129 days in space beginning with their launch in August of 2001. The crew also successfully deployed a small satellite called STARSHINE this morning at 9:02 central time [10:02AM EST/1502 GMT]. STARSHINE has 845 highly polished mirrors that cause it to reflect sunlight. Over the course of its predicted eight-month lifetime, students throughout the world will track STARSHINE as it orbits the Earth, using the information they collect to calculate the density of the Earth's upper atmosphere. Watch NASA TV on Monday to see coverage of the STS-108 and Expedition Three crews' return to Earth. Space Shuttle Endeavour is slated to land at Kennedy Space Center at 11:55 a.m. CST [12:55PM EST/1755 GMT] Monday. More photos at The Houston Chronicle. Check the play-by-play links at upper right for up-to-the-second commentary. Live coverage continues on NASA TV. In what is scheduled to be their final full day in space, the five astronauts and two cosmonauts onboard Space Shuttle Endeavour will prepare for their return to Earth and deploy a small satellite. Preparations for STS-108's return home include checking out equipment and systems that will be used when Endeavour re-enters Earth's atmosphere and touches down. The seven astronauts and cosmonauts aboard the Space Shuttle Endeavour were awakened for their 12th day in space by the song �I�ll Be Home For Christmas,� sung by Bing Crosby. The crew was awakened at 3:14 a.m. CST [4:14AM EST/0914 GMT]. Landing is slated for 11:55 a.m. CST [12:55PM EST/1755 GMT] Monday at Kennedy Space Center, Fla. Weather forecasts indicate generally favorable weather for landing at Kennedy, but there is a chance of rain showers forming offshore. STS-108's return will end a four-month stay in space for the Expedition Three crew. Endeavour's crew will deploy the STARSHINE 2 satellite about 9 a.m. CST [10:00AM EST/1500 GMT] today. As the small satellite orbits the Earth, more than 30,000 students from 26 countries will track it during the next eight months to collect information in order to calculate the density of the upper atmosphere. STS-108 Ground Tracks are available for Monday's landing opportunities. Ask the STS-108 Crew answers and Ask the MCC answers are up. To ask a question, click here. Flight Day 10 images are now available in the NASA gallery. Space Shuttle Endeavour undocked from the International Space Station today at 11:28 a.m. CST (1728 GMT). Before making the final separation burn, STS-108 Pilot Mark Kelly will be at the helm as Endeavour makes a half-circle flyaround of the station. Earlier in the day, STS-108 Commander Dom Gorie and Pilot Mark Kelly, using Endeavour's thrusters, performed a 20-minute maneuver to raise the station's orbit to avoid a piece of space debris. Now, the STS-108 and Expedition Three crews turn their attention to returning home. Endeavour is scheduled to land at 11:55 a.m. CST [12:55PM EST/1755 GMT] Monday at Kennedy Space Center, Fla. Expedition Three will be returning home after a four-month stay at the International Space Station. Flight Day 10 videos are now available in the NASA Gallery. Endeavour undocked from the International Space Station at 11:28 a.m. central time [12:28PM EST/1728 GMT] today, as the two spacecraft flew just off the west coast of Australia. As hooks released and springs gently pushed Endeavour away, Expedition Four crewmember Dan Bursch rang the ship's bell on board the station and announced Endeavour departing, exchanging a final goodbye with STS-108 Commander Dom Gorie. Today's undocking concluded more than one week of joint operations between the shuttle and station crews. Now alone on board the station is the Expedition Four crew, Commander Yury Onufrienko and Flight Engineers Dan Bursch and Carl Walz. The orbiter will perform a final separation burn shortly [1:52PM EST/1852 GMT], to begin the final leg of its journey home. It is currently flying "windows-up", with the belly of the spacecraft facing the Earth. Check the play-by-play links at upper right for up-to-the-second commentary. Live coverage continues on NASA TV. Endeavour now will undock from the International Space Station at 11:28 a.m. central time [12:28PM EST/1728 GMT] providing an opportunity for a one-half lap flyaround of the station. Flight controllers opted for the 51 minute delay in today's undocking, which allows for a combination of efficient propellant use and orbital dynamics permitting the increase in the flyaround of the station by Pilot Mark Kelly. Following the half lap flyaround, a final separation burn will be initiated at 12:52 p.m. [1:52PM EST/1852 GMT] moving Endeavour away from the station. Flight controllers reevaluated propellant usage and determined that, in concert with minor modifications to shuttle orientation (orbital attitude), they could protect all required propellant margins and still provide the one-half lap flyaround capability. 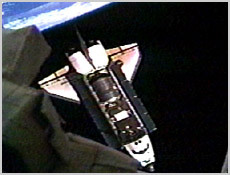 The flyaround provides a valuable opportunity for the shuttle crew to photograph and document the condition of the station as it evolves. Endeavour is scheduled to undock Saturday to begin its trip home, saying good-bye to the Expedition Four crew and bringing the Expedition Three crew home in time for the holidays. Flight Day 7 and Flight Day 8 images are now available in the NASA Gallery. The STS-108 and Expedition Three crews are going to begin their trip home today when Space Shuttle Endeavour undocks from the International Space Station. Endeavour's crewmembers will bid farewell to the Expedition Four crew and close the hatches to the station about 7:30 a.m. CST [8:30AM EST/1330 GMT]. Undocking is scheduled to occur at 10:37 a.m. CST [11:37AM EST/1637 GMT]. Following undocking, Endeavour will make a quarter-circle fly-around of the station before the final separation burn is performed. STS-108 is slated to touch down at 11:55 a.m. CST [12:55PM EST/1755 GMT] Monday at Kennedy Space Center, Fla. But before undocking, STS-108 Commander Dom Gorie and Pilot Mark Kelly will use Endeavour to perform a series of jet firings to raise the space station's orbit by about 1.2 kilometers (.75 miles). The reboost will increase the distance between the station and a piece of an old Russian rocket that could pass within 4.8 kilometers (3 miles) of the orbital outpost. The reboost maneuver, which is scheduled to begin at 8:55 a.m. CST [9:55 EST/1455 GMT], is expected to increase that distance that the debris passes by more than 64 kilometers (40 miles). Ask the STS-108 Crew answers and Ask the MCC answers. To ask a question, click here. The highlight of the STS-108 crew�s last full day at the International Space Station was the Raffaello Multi-Purpose Logistics Module�s return to Space Shuttle Endeavour�s payload bay. 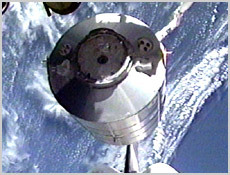 STS-108 Pilot Mark Kelly and Mission Specialist Linda Godwin used Endeavour�s robot arm to detach Raffaello from the International Space Station. They berthed Raffaello, which was provided by the Italian Space Agency, into the payload bay at 4:44 p.m. CST [5:44PM EST/2244 GMT] Friday. Raffaello contains unneeded station items that will return to Earth. Now, the crew returns its attention to its departure from the station. Endeavour is scheduled to undock at 10:37 a.m. CST [11:37AM EST/1637 GMT] Saturday. Returning to Earth on Endeavour will be the Expedition Three crewmembers. Endeavour is slated to land at Kennedy Space Center, Fla., at 11:55 a.m. CST [12:55PM EST/1755 GMT] Monday. Endeavour and the International Space Station are spending a final night together, preparing for the shuttle's departure on Saturday. Before leaving, Endeavour is now planned to fire its jets Saturday morning to raise the station's altitude by about three-quarters of a mile. The boost will ensure the station flies well clear of an old Russian rocket body that could have intersected the station's orbit on Sunday. Videos for Flight Day 8 and Flight Day 9 are now available in the NASA Gallery. The highlight of the STS-108 crew�s last full day at the International Space Station was the Raffaello Multi-Purpose Logistics Module�s return to Space Shuttle Endeavour�s payload bay. STS-108 Pilot Mark Kelly and Mission Specialist Linda Godwin used Endeavour�s robot arm to detach Raffaello from the International Space Station. They berthed Raffaello, which was provided by the Italian Space Agency, into the payload bay at 4:44 p.m. CST (2244 GMT) Friday. Raffaello contains trash and unneeded station items that will return to Earth. The hatch between the Unity module of the station and the Raffaello Multi-Purpose Logistics Module was closed this morning at 10:32 a.m. central time [11:32AM EST/1632GMT] today. Now, the crew returns its attention to its departure from the station. Endeavour is scheduled to undock at 10 a.m. CST [11AM EST/1600 GMT] Saturday. Returning to Earth on Endeavour will be the Expedition Three crewmembers. Endeavour is slated to land at Kennedy Space Center, Fla., at 11:55 a.m. CST [12:55PM EST/1755 GMT] Monday. Flight controllers also report that maintenance work on one of two air conditioners in the Zvezda module of the station is now complete and the air conditioner may be activated later this afternoon. Videos for Flight Day 6 and Flight Day 7 are now available in the NASA Gallery. The STS-108 and Expedition Three crews will spend their final full day at the International Space Station conducting joint operations with the Expedition Four crew. This morning, the crews will focus on the final transfer activities before closing the hatch to the Raffaello Multi-Purpose Logistics Module. Later in the day, STS-108 Pilot Mark Kelly and Mission Specialist Linda Godwin will use Space Shuttle Endeavour's robot arm to detach Raffaello from the station and return it to the payload bay. The crews will also have their final briefing about Endeavour's departure from the station. Endeavour is scheduled to undock at 10 a.m. CST [11AM EST/1600 GMT] Saturday to begin its trip home. The crew members onboard the space shuttle Endeavour will be awakened this morning at 5:19 a.m. CST. [6:19AM EST] The Expedition Four crew onboard the International Space Station will awaken at 5:49 a.m. CST [6:49AM EST]. Endeavour, whose mission had previously been extended by one day, could possibly have to come home early after all. A malfunctioning component of the guidance system, called an IMU, had an unexplained temporary failure. This is a triple-redundant system - there are three IMUs, and Endeavour can fly on only one - but if two of them fail, mission managers would have to curtail the Shuttle flight and call Endeavour home early, for safety's sake. The weather for Monday's landing looks iffy, as well. So far, landing remains scheduled for 12:55PM EST (1755 GMT) on 17-Dec-2001 at KSC. The STS-108, Expedition Three and Expedition Four crews continued joint operations on Thursday. One of the activities was the loading of the Raffaello Multi-Purpose Logistics Module with trash and items returning to Earth. The STS-108 crew will use Space Shuttle Endeavour�s robot arm to detach Raffaello from the International Space Station and return it to the orbiter�s payload bay on Friday. 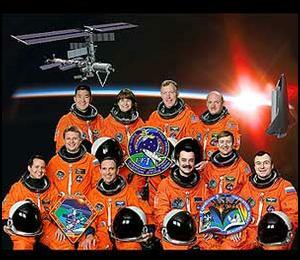 Friday will be the final full day at the station for the STS-108 and Expedition Three crews. Endeavour is scheduled to undock at 11:55 a.m. CST [12:55PM EST/1755 GMT] Saturday. Flight Day 6 images are now available in the NASA Gallery. More mission video at The Houston Chronicle. Check the play-by-play links at upper right for up-to-the-second commentary. Live coverage continues on NASA TV. 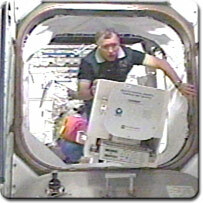 After being allowed to sleep an extra hour this morning, the STS-108 crew will devote time during the day to loading unneeded items into the Raffaello Multi-Purpose Logistics Module. Raffaello, a reusable cargo carrier supplied by the Italian Space Agency, will be unberthed from the International Space Station and returned to Space Shuttle Endeavour's cargo bay on Friday. Endeavour is scheduled to undock from the station Saturday morning. In addition to Raffaello, the Expedition Three crew will return to Earth on Endeavour. Onboard the space station at 3:09 p.m. CST [4:09PM EST/2109 GMT] today, there will be a ceremony to mark the handover of station command from Expedition Three's Frank Culbertson to Expedition Four's Yury Onufrienko. A ceremonial change of command between Expedition Three Commander Frank Culbertson and Expedition Four Commander Yury Onufrienko is scheduled for 4:09PM EST today. The official crew exchange occurred Saturday, December 8 with the transfer of Soyuz seat-liners for each crew member. Today�s event continues the tradition begun by Expedition One Commander Bill Shepherd in March of this year, when he relinquished command of Alpha to Expedition Two Commander Yury Usachev. Shuttle and station crews have unloaded nearly 95 percent of the cargo, or about 2,087 kilograms (4,600 pounds), inside the Raffaello module. Now the crews are packing unneeded gear and trash inside the module for return to Earth. On Friday, Raffaello will be unberthed from the International Space Station and placed back inside Space Shuttle Endeavour's payload bay. 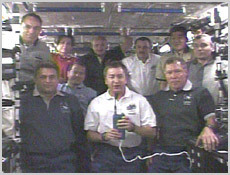 The STS-108 crew, now including the homebound Expedition Three crew, assisted the Expedition Four crew in replacing components in a station treadmill. The old components will be stowed inside Raffaello, refurbished on Earth and used again. Endeavour completed the third reboost of the station Wednesday. On Thursday, the Expedition Three crew will formally handover occupation of the station to the Expedition Four crew. Mission Control Center images are now available in the NASA Gallery. STS-108 Commander Dom Gorie, Pilot Mark Kelly and Mission Specialists Linda Godwin and Dan Tani will spend Flight Day 8 conducting joint operations with the International Space Station crews. One of their tasks includes loading the Raffaello Multi-Purpose Logistics Module with items that will be returning home to Earth. The crew will unberth Raffaello from the station and return it to Endeavour's payload bay on Friday. Today and Thursday, the crewmembers will also assist Expedition Four with some maintenance tasks inside the station. They will replace some parts in the station's treadmill today. Thursday's maintenance tasks include replacing a compressor in the Zvezda Service Module's air conditioner. Space Shuttle Endeavour is scheduled to undock from the station on Saturday to begin the trip home. The Expedition Three crew will return to Earth on Endeavour to wrap up four months in space. Landing is scheduled for Monday at Kennedy Space Center, Fla. The third and final planned reboost of the Station was completed this morning. Over the course of an hour, Shuttle Commander Dom Gorie very gently pulsed the small jets on Endeavour to increase the high point of the station's altitude by about 4.5 miles. The total increase in Alpha's altitude from all three reboosts is about 8.5 statute miles. More mission video clips at Space.com. Flight Day 8 has begun on board Endeavour with a wake-up call to Mission Specialist Dan Tani and his crewmates, waking at 6:19 a.m. [7:19AM EST] to the sounds of Fly me to the Moon sung by Oliver (Ollie) O�Regin. Today's efforts on board Endeavour and the International Space Station will focus on annual maintenance for the on-board treadmill, called TVIS, as well as continuing transfer operations. The Expedition Three and Four crews also will continue their series of handover briefings as the station's newest residents settle into their orbital home. Ask the STS-108 Crew answers and Ask the MCC answers are up. To ask a question, click here. Check the play-by-play links at upper right for up-to-the-second commentary. Live coverage continues on NASA TV. In an eventful Tuesday for the STS-108 crewmembers, they learned that they will get an extra day at the International Space Station. Managers decided to extend Space Shuttle Endeavour�s stay at the station by one day for maintenance work inside the station and to give more time for transfer operations. Endeavour is now slated to undock from the station on Saturday and return to Earth on Dec. 17. To begin their day, the STS-108, Expedition Three and Expedition Four crews participated in the "Anthems of Remembrance" event to pay tribute to the victims of the Sept. 11 terrorist attacks on the United States. Then, the focus shifted to the unloading of the Raffaello Multi-Purpose Logistics Module. Later in the day, the three crews also participated in the Joint Crew News Conference in which they fielded questions from U.S. media. Flight Day 3 and Flight Day 4 images are now available in the NASA Gallery. Ceremony video here. The 10 crewmembers of STS-108, Expedition Three and Expedition Four took part in the "Anthems of Remembrance" event. The national anthems of the United States and Russia were played onboard Space Shuttle Endeavour, the International Space Station and Mission Control in Houston, Texas. Also, STS-108 Commander Dom Gorie, Expedition Three Commander Frank Culbertson and Expedition Four Commander Yury Onufrienko shared their thoughts. The crews will now focus on transfer activities. They will continue unloading supplies and equipment inside the Raffaello Multi-Purpose Logistics Module. Also today, all three crews will also take part in the Joint Crew News Conference at 2:04 p.m. CST [3:04PM EST/2004 GMT], and there will be a ceremony marking the change of station command from Expedition Three's Frank Culbertson to Expedition Four's Yury Onufrienko. Today's events follow yesterday's successful spacewalk to stabilize the temperature of two motors which position the Station's giant solar panels. Watch NASA TV on Tuesday at 7:46 a.m. CST [8:46AM EST/1346 GMT] to see the STS-108, Expedition Three and Expedition Four crewmembers and Mission Control mark the three-month anniversary of the terrorist attacks on the United States. Then at 9:24 a.m. CST [10:24AM EST/1524 GMT), Expedition Four Commander Yury Onufrienko, Expedition Three Pilot Vladimir Dezhurov and Expedition Three Flight Engineer Mikhail Tyurin field questions from Russian media. Tuesday afternoon at 2:04 CST [3:04PM EST/2004 GMT], all three crews will hold the Joint Crew News Conference from inside the Destiny Laboratory Module. The news conference will be followed by an International Space Station change of command ceremony at 2:48 p.m. CST [3:48PM EST/2048 GMT]. Check the play-by-play links at upper right for up-to-the-second commentary. Live coverage today on NASA TV. The STS-108 crew successfully wrapped up the mission's only planned space walk at 4:04 p.m. CST (2204 GMT) Monday. Mission Specialists Dan Tani and Linda Godwin performed the 4-hour, 12-minute space walk. They installed insulating blankets onto two Beta Gimbal Assemblies, or BGAs, atop the International Space Station's P6 Truss. The BGAs control the large U.S. solar arrays as they track the Sun. The blankets will protect the BGAs from the temperature variances in space that lead to current spikes in the BGAs' motors. They also performed some get-ahead tasks in preparation for the space walks that will be performed when STS-110 visits the station early next year. 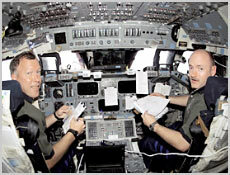 Commander Dom Gorie, who served as the space walk coordinator, and Pilot Mark Kelly, who operated Endeavour's robot arm, assisted the two space walkers from inside Space Shuttle Endeavour. The space walk was the 31st in support of space station assembly and maintenance. Today's space walk was the 18th space walk conducted by astronauts and cosmonauts this year, an all-time space flight record. The most space walks ever done in previous years were 9 each in 1973 from Skylab and in 1997 from the shuttle and Russian Mir space station. The hatches between Endeavour and the station were reopened Monday evening to allow the STS-108, Expedition Three and Expedition Four crews to resume joint operations. Flight Day 5 videos are now available in the NASA Gallery. Mission Specialists Dan Tani and Linda Godwin began STS-108's only scheduled space walk at 11:53 a.m. CST (1753 GMT) today. The primary objective is to install insulating blankets onto two Beta Gimbal Assemblies, or BGAs, atop the International Space Station's P6 Truss. The insulation is hoped to moderate temperatures experienced by the mechanisms that may be deforming the motor's shell and impeding its operation. [The astronauts] are also scheduled to perform some get-ahead tasks in preparation for the space walks that will be performed when STS-110 visits the station early next year. Godwin and Tani are receiving support from inside Space Shuttle Endeavour by Commander Dom Gorie and Pilot Mark Kelly. Gorie is the space walk coordinator, and Kelly is the shuttle's robot arm operator. The space walk is scheduled to wrap up about 3:48 p.m. CST (2148 GMT). Following the completion of the space walk, the hatches between Endeavour and the station will reopen and joint operations will resume. The astronauts began the 31st EVA devoted to assembly and maintenance of the ISS at 12:53PM EST today. Linda Godwin has red stripes on the legs of her space suit, and Dan Tani is in an all-white suit. The port side BGA blanket was installed first, followed by the starboard side blanket. Installation was complete at 3:13PM EST, enabling the spacewalkers to press on with several get-ahead tasks in preparation for the next Shuttle assembly mission to the ISS in March. Endeavour's two spacewalkers were awakened this morning by the sounds of Brass, Rhythm and Reeds, a local 18-piece big band in which Mission Specialist Linda Godwin plays tenor sax. The wake-up music today was Jumpin at the Woodside. Godwin and fellow space walker Dan Tani are set to exit Endeavour's airlock at 11:24 a.m. central time [12:24PM EST/1724 GMT] today for a planned four hour spacewalk. The goal of today's spacewalk is to place insulating blankets on the two Beta Gimbal Assemblies (BGA) that control the rotation of the solar arrays as they track the sun. The thermal blankets will protect the BGAs from temperature variances experienced in space, which has been leading to current spikes from the motors inside the BGAs. The Expedition Four crew will spend its first day alone on board the International Space Station, with hatches between Endeavour and the station closed in preparation for today's spacewalk. Yury Onufrienko, Dan Bursch and Carl Walz will spend the day transferring supplies and equipment from the Raffaello module to the station. Today's activities follow yesterday's moving tribute to the victims of the September 11th terror attacks in New York, Washington, and Pennsylvania. The new ISS commander noted that the Station symbolized the benefits of international co-operation. Sunday afternoon, the crews of Space Shuttle Endeavour and the International Space Station honored the victims, the victims� families and rescue workers of the Sept. 11 terrorist attacks. The ceremony occurred inside the Destiny Laboratory Module where they displayed an American flag and took a moment to pay tribute. In other activities, the STS-108 crew conducted joint operations with the Expedition Three and Four crews. They unloaded the Raffaello Multi-Purpose Logistics Module. The STS-108 crewmembers also spent time preparing for Monday�s space walk by Mission Specialists Linda Godwin and Dan Tani. The space walk is scheduled to begin at 11:24 a.m. CST [12:24PM EST/1724 GMT] Monday. The hatches have been closed temporarily between Endeavour and the International Space Station in preparation for [the EVA] planned Monday. The hatches were closed to allow Endeavour's cabin pressure to be lowered as part of a protocol to prevent space walkers from suffering decompression sickness. The hatches will reopen after tomorrow's four-hour space walk. Astronauts Tani and Godwin also got ready for tomorrow's spacewalk, the only one scheduled for this mission. Check the NASA TV schedule for live coverage of tomorrow's EVA. Flight Day 4 videos are now available in the NASA Gallery. Today, the 10 crewmembers of the STS-108, Expedition Three and Expedition Four will honor the victims, the victims' families and rescue workers of the Sept. 11 terrorist attacks. A ceremony is slated to begin at 4:24 p.m. CST [5:24PM EST/2224 GMT]. Space Shuttle Endeavour is also carrying nearly 6,000 U.S. flags as part of the "Flags for Heroes and Families" campaign. Other activities today will include the unloading of the Raffaello Multi-Purpose Logistics Module and preparations for the space walk by STS-108 Mission Specialists Linda Godwin and Daniel Tani. The space walk is scheduled to start at 11:24 a.m. CST [12:24PM EST/1724 GMT] Monday. Flight Day 2 images are up in the NASA Gallery. Endeavour's crew, now including Expedition Three crew members Frank Culbertson, Vladimir Dezhurov and Mikhail Tyurin, were awakened to the sounds of "It's A Grand Ol' Flag" as played by the Fire Department of New York Emerald Society Pipes & Drums. Endeavour's Pilot Mark Kelly visited the World Trade Center with former NASA Administrator Dan Goldin shortly after the September 11 attacks and was presented with the CD from one of the firefighters. Today, all the astronauts and cosmonauts onboard Endeavour and the International Space Station will pay tribute to the September 11 victims, their families and rescue workers in a special message slated for 4:24 p.m. central time [5:24PM EST/22:44 GMT]. Most of the crew's activities on board today will focus on continuing transfer of equipment, hardware and supplies between Endeavour and the station,and handover briefings between the Expedition Three and Four crews. "Ask the MCC" Answers are now available. Saturday was the first full day of joint operations for the Space Shuttle Endeavour and International Space Station crews. 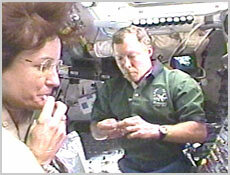 STS-108 Pilot Mark Kelly and Mission Specialist Linda Godwin installed the Raffaello Multi-Purpose Logistics Module onto the station. Three events Friday kicked NASA a little further into its own immediate future, setting the stage for a new administration, continuing the International Space Station's mission and opening a new window into a little known region just above our planet. First, a Delta II rocket carried two NASA science missions into space: Jason 1, NASA's newest oceanography satellite, and TIMED, which will study the region above Earth's atmosphere between 40 and 110 miles from the surface. Also on Friday morning, Sean O'Keefe, President Bush's nominee to be the next NASA administrator, had his confirmation hearing. 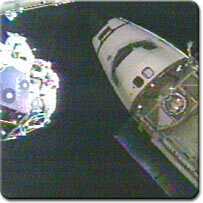 Finally, just before 4 p.m. EDT, STS-108 docked with the International Space Station, carrying the Expedition Four crew. In addition to their logistical mission, the crews will take time Sunday evening to honor the victims of the Sept. 11 terrorist attacks. Flight Day 3 videos are now available in the NASA Gallery. 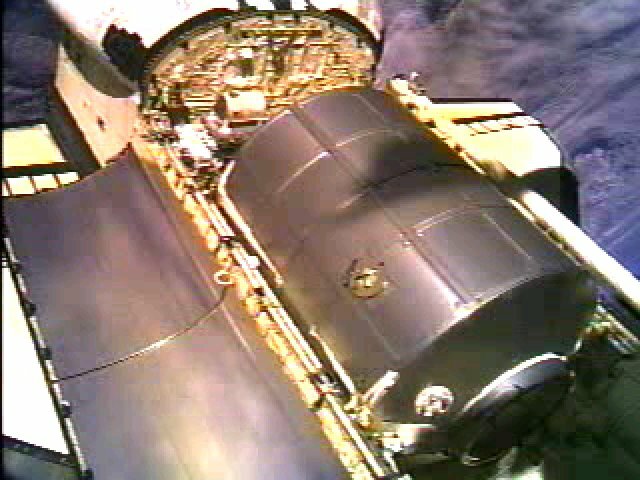 The STS-108 crew installed the Raffaello Multi-Purpose Logistics Module onto the International Space Station's Unity Module. 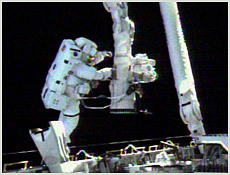 Mission Specialist Linda Godwin and Pilot Mark Kelly used Space Shuttle Endeavour's robot arm to lift Raffaello out of the payload bay and install it onto the station's Unity Module. Installation was completed at 11:55 a.m. CST [12:55PM EST/(1755 GMT] today. Raffaello contains about 2.7 metric tons (3 tons) of supplies and equipment. Also on Saturday at 3:44 p.m. CST [4:44PM EST/2144 CST], STS-108 Commander Dom Gorie and Pilot Mark Kelly, Expedition Three Commander Frank Culbertson and Expedition Four Commander Yury Onufrienko will participate in interviews with MSNBC, CBS News �Up to the Minute� and WAGT-TV of Augusta, Ga. Follow the flight live on NASA TV! The first full day of joint operations has a busy schedule in store for the STS-108 and International Space Station crews. The major event for the STS-108 crew is the installation of the Raffaello Multi-Purpose Logistics Module. Pilot Mark Kelly and Mission Specialist Linda Godwin will use Space Shuttle Endeavour's robot arm to lift Raffaello out of the payload bay and install it onto the station's Unity Module. Raffaello is scheduled to be unberthed from the payload bay at 10:19 a.m. CST (1619 GMT) and installed onto Unity at 12:39 p.m. CST (1839 GMT) today. Meanwhile, Mission Specialist Daniel Tani will focus on transferring equipment and supplies from Endeavour to the station, and Commander Dom Gorie will oversee vehicle operations. The Expedition Three and Four crews will swap out seat liners in the station's Soyuz spacecraft that serves as the crew return vehicle. The swap out will mark the transfer of station command from Expedition Three to Expedition Four. The Expedition Three crew will become members of the shuttle crew today. Watch NASA TV on Saturday to see coverage of the installation of the Raffaello Multi-Purpose Logistics Module onto the International Space Station. Raffaello is slated to be unberthed from Space Shuttle Endeavour�s payload bay at 10:19 a.m. CST [11:19 EST/1619 GMT] and installed onto the station at 12:39 p.m. CST [1:39PM EST/1839 GMT] Saturday. Yesterday's docking was not problem-free either, as part of the docking mechanism got stuck, temporarily preventing an airtight seal. The Endeavour crew was able to adjust the docking ring and fully engage the two spacecraft without having to venture outside (as the ISS cosmonauts had to do early this week). STS-108 became the 12th shuttle mission to visit the International Space Station when Space Shuttle Endeavour docked with the orbital outpost at 2:03 p.m. CST [3:03PM EST/2003 GMT] Friday. 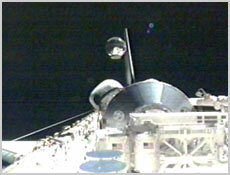 Docking occurred as the two spacecraft flew over England. Endeavour carried the Expedition Four crew to the station and will return Expedition Three to Earth. The primary cargo for STS-108 is the Raffaello Multi-Purpose Logistics Module, which will be installed onto the station on Saturday. The Expedition Four crew will take over formal command of the station on Saturday as well. The hatches between the station and shuttle were opened Friday afternoon. Shortly after greeting each other, the crews began a week of joint operations. The STS-108 crew will also conduct a space walk on Monday. Endeavour is slated to undock on Dec. 14. Flight Day 2 videos are now available in the NASA Gallery. Space Shuttle Endeavour continues to close in on the International Space Station. The STS-108 crew will perform rendezvous operations before the shuttle docks with the station at 1:59 p.m. CST [2:59PM EST/1959 GMT] today. At the time of the linkup, the two spacecraft will be flying off the British coast southwest of Cardiff, Wales. The crew was awakened at 6:21 a.m. today [7:21AM EST] to begin the final phases of rendezvous and docking. At 11:44 a.m. [12:44PM EST], Endeavour should be about 9 1/2 miles away from the Space Station, eventually moving to a position 600 feet directly below the station. NASA is honoring the victims of the Sept. 11 terrorist attacks by sending nearly 6,000 flags into orbit as part of the "Flags for Heroes and Families" campaign. The flags were launched on Space Shuttle Endeavour on Dec. 5. After the completion of STS-108, the flags will be mounted on specially designed memorial certificates and presented to the survivors and families of the victims in New York and the Pentagon and to the families of the heroes killed aboard United Airlines flight 93, which crashed in Pennsylvania. Watch NASA TV on Friday to see coverage of Space Shuttle Endeavour's arrival at the International Space Station. Endeavour is slated to dock with the station at 1:59 p.m. CST [2:59PM EST/1959 GMT]. The two crews are scheduled to open the hatches between the spacecraft and greet each other at 3:58 p.m. CST [4:58PM EST/2158 GMT]. 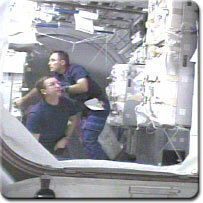 This mission calls for one spacewalk, to be performed by astronauts Linda Godwin and Dan Tani, on Monday (10 Dec 2001). Check the play-by-play links at upper right for up-to-the-second commentary. This afternoon's docking may be carried live on NASA TV. As smoke still rises from the wreckage of September 11th, let's remember what happened 60 years ago on this day: Pearl Harbor. "The price of liberty is eternal vigilance!" As Space Shuttle Endeavour continued to chase the International Space Station on Thursday, the STS-108 crew prepared for Friday's docking and the mission's space walk. As of 7 p.m. Thursday, Dec. 6, Endeavour was 3,500 statute miles behind the station, closing in 260 miles with each hour and a half long orbit of Earth. The crew today tested the shuttle's rendezvous systems, docking mechanism, robotic arm and space suits to prepare for major events to come. The crew goes to sleep tonight at 10:19 p.m. CST and awakens at 6:19 a.m. CST Friday. Endeavour is planned to begin the final rendezvous phase at 11:44 a.m. CST Friday. Commander Dom Gorie will take manual control of the shuttle at about 1 p.m. CST as it pulls within a half-mile of the station. Docking is planned at 1:59 p.m. CST and the hatches are expected to be opened at about 4 p.m. CST. Note that JSC (in Texas) reports time in the Central Time Zone (CST) and KSC (in Florida) reports it in Eastern Time (EST). It can be confusing! Docking is expected shortly before 3PM EST. Flight Day 1 images and Flight Day 1 videos are now available in the NASA Gallery. Space Shuttle Endeavour will spend its first full day in space closing in on the International Space Station. Today's activities for the crew will include preparing shuttle systems for docking and checking out Endeavour's robot arm and equipment that will be used during the space walk. Endeavour is slated to dock with the station at 1:59 p.m. CST [2:59PM EST/19:59 GMT] Friday. Expedition Four Commander Yury Onufrienko and Flight Engineers Carl Walz and Daniel Bursch are en route to the International Space Station to replace the Expedition Three crew. They began their journey Wednesday when Space Shuttle Endeavour lifted off from Kennedy Space Center, Fla. STS-108 is scheduled to arrive at the station at 2:59 p.m. EST (1959 GMT) Friday. Meanwhile, Expedition Three Commander Frank Culbertson, Pilot Vladimir Dezhurov and Flight Engineer Mikhail Tyurin welcomed the news of the launch of Endeavour. They will spend time Thursday and Friday wrapping up preparations for Endeavour's arrival. Expedition Three will return to Earth on Endeavour to conclude a four-month stay on the station. Space Shuttle Endeavour lifted off from the Kennedy Space Center, Fla., at 5:19 p.m. EST today en route to the International Space Station. The primary task of this mission, STS-108, is to deliver the Expedition Four Crew -- Commander Yuri Onufrienko, and Flight Engineers Carl Walz and Dan Bursch -- and return the Expedition Three crew home to Earth. This is the 12th space shuttle mission to visit the station. Endeavour is scheduled to dock with the station at 2:04 p.m. CST [3:04PM EST/20:04 GMT] Friday. Activities at the station will include one space walk, the transfer of supplies and equipment and the rotation of the station crew. The station's current residents, the Expedition Three crew -- Frank Culbertson, Vladimir Dezhurov and Mikhail Tyurin -- have been aboard the station since August. Dominic Gorie commands Endeavour with Mark Kelly as pilot. Astronauts Linda Godwin and Daniel Tani are mission specialists. Endeavour will return to Earth on Dec. 16. Mission Commander Dom Gorie made a stirring remark just before liftoff: "We're all aware that for over 200 years and certainly over the last two months, freedom rings loud and clear across this country. But right here and right now, it's time to let freedom roar. Let's light them up!" We couldn't agree more! Launch video available at The Houston Chronicle. Pre-flight images are available in the NASA Gallery. STS-108 is slated to launch today at 4:19 p.m. CST [5:19PM EST/22:19 GMT]. Space Shuttle Endeavour will carry the Expedition Four crew and the Raffaello Multi-Purpose Logistics Module to the International Space Station and return the Expedition Three crew to Earth. STS-108 will be the 12th shuttle mission to visit the station. STS-108 was scheduled to launch on Tuesday but it was delayed until today due to poor weather at Kennedy Space Center, Fla. Forecasts for today indicate a 70-percent chance of acceptable weather for today's launch attempt. With the STS-108 launch countdown continuing smoothly, Chief Astronaut Charlie Precourt is flying the Shuttle Training Aircraft to assess weather conditions at KSC. After counting down to launch minus five minutes and holding to allow rain showers to clear the vicinity of the launch pad, [Tuesday's] launch of Endeavour was delayed for 24 hours due to low clouds and rain. STS-108 will be the 12th shuttle mission to visit the International Space Station. Watch the launch live at 5:19PM EST on NASA Television, where coverage begins at noon. The launch of STS-108 was delayed by one day on Tuesday due to poor weather at Kennedy Space Center, Fla. Space Shuttle Endeavour is now scheduled to lift off at 4:19 p.m. CST (2219 GMT) Wednesday. The countdown was delayed for the removal of temporary handrails on the launchpad. The railing should have been de-installed Monday. Watch NASA TV on Tuesday to see STS-108 lift off at 4:45 p.m. CST (2245 GMT) to begin its trip to the station. NASA TV's coverage will begin at 11:30 a.m. CST (1730 GMT). NASA TV coverage begins at 12:30PM EST, with liftoff scheduled for about 5:45PM EST. Wartime conditions are putting the entire area on high alert. Check the links at right for play-by-play, as the countdown continues. Expedition Three Pilot Vladimir Dezhurov and Flight Engineer Mikhail Tyurin were able to clear debris from one of the docking mechanisms on the International Space Station, allowing the Progress 6 module to complete docking with the station. In two-hour, 45-minute spacewalk, the cosmonauts cleared away a rubberized O-ring, apparently left behind when the Progress 5 module undocked on Nov. 22. The successful spacewalk and docking clears the way for a launch attempt of STS-108 on Tuesday. Lift off is set for 4:45 p.m. CST (2245 GMT) Tuesday. Space Shuttle Endeavour will be carrying the Expedition Four crew and the Raffaello Multi-Purpose Logistics Module to the station. Endeavour will return the Expedition Three crew to Earth. It will be the 12th shuttle mission to the station. NASA TV coverage begins at 12:30PM EST, with liftoff scheduled for about 5:45PM EST. No-fly zones, anti-aircraft guns, and unprecedented security will be in place to assure the safety of the first Shuttle flight since the September 11th attacks. Watch NASA TV at 7 a.m. (1300 GMT Monday) to see coverage of Expedition Three's fourth space walk. Pilot Vladimir Dezhurov and Flight Engineer Mikhail Tyurin will begin the space walk about 7:30 a.m. CST (1330 GMT) to remove an obstruction that is preventing the firm docking of the Progress 6 cargo ship with the International Space Station. Coverage begins at 8AM EST, with the EVA scheduled for about 8:30AM. International Space Station and Space Shuttle managers have rescheduled the launch of Space Shuttle Endeavour to Tuesday at 5:45 p.m. EST from NASA's Kennedy Space Center, Fla. The new date will allow sufficient time for a spacewalk to clear an apparent obstruction in a docking mechanism on the International Space Station's Zvezda module. This apparent obstruction is believed to be preventing hooks and latches from fully engaging to secure a Russian Progress supply vehicle to its docking port. Friday morning, managers made a decision to push back the launch of STS-108 to give the International Space Station crew and flight controllers more time to firmly dock the uncrewed Progress cargo ship. Space Shuttle Endeavour is slated to lift off from Kennedy Space Center, Fla., at 4:45 p.m. CST (2245 GMT) Tuesday. STS-108 will deliver the Expedition Four crew to the station and return the orbital outpost's current residents, the Expedition Three crew, to Earth. Also, the Raffaello Multi-Purpose Logistics Module will be making its second trip to the station. 30 November 2001 - MORE DELAY! NASA managers need more time to assess the situation with the ISS, and will not even try to launch Friday. We may see Endeavour lift off Saturday (1 Dec) or possibly Monday. When Space Shuttle Endeavour lifts off on its STS-108 mission, a group of Marshall engineers will provide an extra set of eyes and ears to ensure a safe and successful launch. The STS-108 mission will take a fourth crew to the Space Station and deliver new experiments � winding up a record- breaking year of missions that completed the first phase of the Station's orbital assembly and kicked off the first Station science activities. At the Kennedy Space Center, Fla., NASA flight controllers are preparing for liftoff of the space shuttle Endeavour Friday evening, after a 24-hour postponement due to issues with docking of a Russian cargo ship at the International Space Station. Russian flight controllers are performing a structural analysis following the docking. Preliminary analysis indicates that a piece of debris in the docking interface is keeping latches from fully retracting. The Progress 6 cargo ship arrived at the station Wednesday and remains in a soft-dock configuration. It contains supplies for Expedition Three's replacements, Expedition Four. The flight of mission STS-108 was postponed to give controllers time to complete the analysis. Space Shuttle Endeavour is now slated to launch at 7:18 p.m. EST Friday. Its primary mission is the delivery of the Expedition Four crew and the Raffaello Multi-Purpose Logistics Module to the station and the return the Expedition Three crew to Earth. Mission managers in Houston will meet Friday morning to review options and make a recommendation on Friday's launch opportunity. NASA Controllers this morning postponed launch of the space shuttle Endeavour on a mission to the International Space Station. 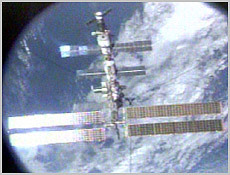 The delay of mission STS-108 is due to a problem with the docking of an autonomous Russian Progress cargo spacecraft at the space station. The Progress arrived yesterday and appeared to have "soft-docked" successfully. 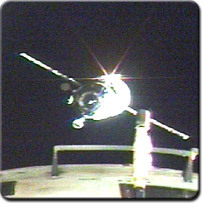 However, Mission Control in Moscow did not receive a signal indicating a "hard-dock." The problem is either with the docking itself or the sensor that that signals its completion. NASA officials are assessing the situation. For now, launch is rescheduled to tomorrow within the launch window of 7:18 - 7:23 p.m. ET. STS-108's primary mission is to deliver the Expedition Four crew to the station and bring home the Expedition Three crew, whose three members have been at the station since August. The 24-hour delay will allow additional time to complete a structural analysis following yesterday's docking of the Progress 6 resupply vehicle. The Progress vehicle remains in a soft-dock configuration. Russian analysis indicates a piece of debris, possibly a wire or cable, in the docking interface between the Progress and the Zvezda Service Module is keeping the latches from fully retracting. The current ISS crew may have to perform a spacewalk to clear the obstruction, which Russian flight controllers claim poses no danger to the Shuttle docking. Stay tuned! Students in schools worldwide from first graders to undergraduates are anticipating with excitement the next space shuttle mission, STS-108, scheduled for launch Thursday, as it will carry their experiments into space. The Space Shuttle Small Payloads Project is providing flight opportunities for nearly 40 experiments designed to engage students in space and scientific exploration. 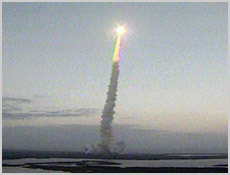 Most notable among the educational experiments aboard Endeavour is the Student Tracked Atmospheric Research Satellite for Heuristic International Networking Experiment (STARSHINE-2). Students around the world participated in preparing STARSHINE, a satellite designed to teach kids about satellite orbits and natural events that affect these orbits. Endeavour is scheduled to liftoff from the Kennedy Space Center on Thursday at 7:41 p.m. ET. The primary mission it to deliver the Expedition Four crew to the International Space Station and return the Expedition Three crew to Earth after more than three months in space. The only concern (besides the ones on the ground) is that the Progress cargo ship which recently docked to the Space Station Alpha (AKA ISS) does not seem to be firmly latched on. NASA would probably want this resolved before Endeavour docks. 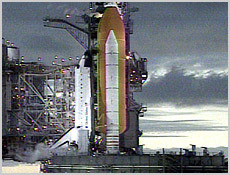 At Kennedy Space Center, Fla., preparations and the countdown for the launch of STS-108 continue on schedule. Liftoff for STS-108, which will deliver the Expedition Four crew to the International Space Station, is set for 6:41 p.m. CST Thursday (0041 GMT Friday). Final engine preparations were under way Wednesday morning for Space Shuttle Endeavour. Late stowage operations were scheduled to take place Wednesday evening, and the rotating service structure is slated to be moved into the park position at 10:30 p.m. CST Wednesday (0430 GMT Thursday). Workers will begin fueling Endeavour's external tank at 10:16 a.m. CST (1616 GMT) Thursday. Forecasts indicate a 70-percent chance of favorable weather for launch on Thursday. The main threat is the possibility of low cloud ceilings. Tomorrow's launch will be one of the most tightly-guarded ever - NASA is taking no chances in light of the tragic events of September 11th. Preparations for the launch of Space Shuttle Endeavour continue at Kennedy Space Center, Fla. STS-108's launch countdown began Monday at 10 p.m. CST (Tuesday at 0400 GMT) at the T minus 43-hour mark. Launch is scheduled for 6:41 p.m. CST Thursday (0041 GMT Friday). Forecasts call for a 60-percent chance of favorable weather at launch time. STS-108 will deliver the Expedition Four crew and the Raffaello Multi-Purpose Logistics Module to the International Space Station. Check the links at right to see play-by-play countdown and launch info. Liftoff is scheduled for 7:41PM EST on Nov 29th. Live video on NASA TV!